The selectors returns with an instalment from a close 45turns collaborator, Apuglian-born, London-based artist and DJ Ikävä Pii. Ikävä is a serious collator, presenter and lover of music, always with his finger on the pulse and always building new ways to showcase the sounds that he loves to the world. From running the KBRK collective in Bari and creating the ‘outernational’ nomadic radio platform Roaming Radio to his most recent project heading up the enigmatic label TOO MUCH INFORMATION, Ikävä approaches his work from a precious angle, always hitting that spot somewhere between the grooves that others can never seem to find find. This mix for the selectors takes upbeat Brazilian psychrock, electro-punk grooves and hypnotic tribal ruminations amongst other eccentric flavours as its sonic palette, all presented with the smoothest of textures and flawless consistency. Getting lost in this mix is something like a trip to theatre, where a perfectly curated bacchanal of madness takes place before your eyes and fantasy becomes the norm. An eclectic trip, an inversion of the real, crossing continents and moons in 82 minutes. 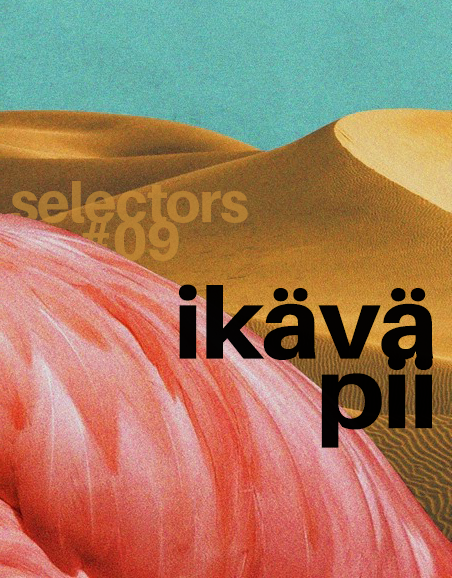 Enjoy selectors #09 from Ikävä Pii.